One of the most classic, promotional items is the highlighter. This versatile product offers your customers and co-workers a durable and convenient tool. Your target group, whether students or working professionals will love this small, useful giveaway. With well known brands such as STABILO and BIC, these promotional highlighters, branded with your logo, can become a tool to increase awareness of your business with every highlighted word. 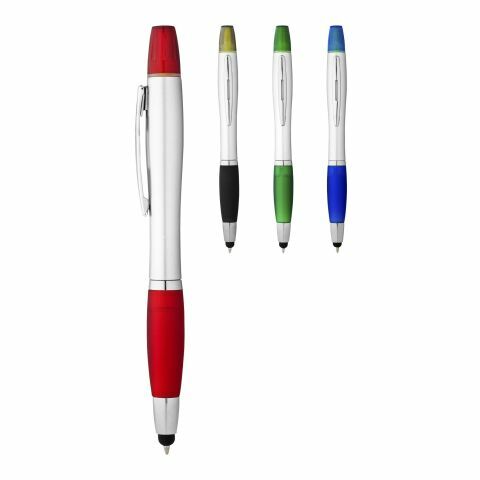 As a part of the promotional pen product family, you benefit from the same things that make printed promotional pens & pencils so effective. Low prices (meaning you get more products even if you are working with a small advertising budget), quick delivery times and the fact that writing instruments are so often shared and passed on (resulting in many more brand impressions per item)! Also, customising these products couldn't be easier! Simply find the product that like, choose your customisation/personalisation options and add to your basket. Once you have checked out a dedicated account manager will contact you regarding your order and to talk you through your order (delivery dates, payment information and your customisation options). We recommend that your logo or artwork ready when ordering (ideally a .ai or .eps format). If you don't have this however that is not a problem. You may wish to call us before placing your order to see if there is anything we can do to make the ordering process that much simpler for you! One of the most useful products in anyone’s stationary kit is the highlighter, they are important writing staples of any household, office or university. Drawing attention to important notes and aiding revision is made easier with the highlighter. At the point of their invention however, they had a whole different purpose: Due to their bright colours, they were first used as children’s colouring pens. In 1963 the first fluorescent pens were available in the United States. They were invented by the American company Carter’s Ink Company. A few years later, a German worker from the company Schwan-STABILO also developed the marker with fluorescent ink. He sent samples to 1000 influential leaders from the political and economic world, as well as potential suppliers. The first colour for the flat marker was yellow, however today you can find many colours such as green, blue, orange, pink and red for the highlighter pen. As a promotional item the highlighter is very popular, due to its exceptional design and practicality. We offer small and large businesses all around the globe the option to print their logo in high quality on practically any promotional products! In our pens & pencils collection we have every product under the sun. Ranging from logo printed stylus pens all the way to promotional highlighters! Everyone who has ever been confronted with large amounts of texts knows that the highlighter is one of the most important companions when fighting through endless paperwork. Make your business environment a little more colourful with highlighters from the UK's leading promotional products supplier allbranded, branded with your logo. Especially effective for schools, universities and offices, these promotional marker pens with neon-coloured ink will strengthen the memorability of your brand and your target groups will always keep your company in mind. The gratitude in receiving such a wonderful promotional pen will strengthen the relationship between you and your customer. Our range of highlighters here at allbranded is extensive and includes big brands like STABILO and BIC. We have highlighters will slim or larger tips, in a set or individually; each variety of pen comes in an array of bright, vivid colours to help draw the eye to important pieces of text. Available in single pens or sets, with various color options. Delight your customers and business partners, whilst supporting your marketing goals at the same time. If you choose one of the well known brands we stock, such as BIC or STABILO, the high quality and premium design of these well known brands will reflect well on your business. Every one of the brands that manufacture our products produce premium, high-quality products, which will convince your business clients and co-workers alike of your good taste. These promotional highlighters are also suitable at conferences and as a small welcome gift for new employees. These personalised highlighters can deliver your promotional message in a subtle way. Some interesting variations of the classic highlighter that we stock include ballpens, 4 in 1 highlighter (which has different coloured tips) or even a syringe text marker!. You can even personalise highlighter sets with your own personal message or logo. In a professional consultation a highlighter is a useful tool. While reading longwearing documents or contracts the opposite person can quickly highlight the most important aspects, with the help of the promotional highlighter. At the end of every meeting you can discreetly give the highlighter to your clients, as a small giveaway. By doing this you will establish a personal relationship with the client but also show the message of your company. On a wider scale, the highlighters can also be given out at exhibitions and conferences, either packed into small gift bags or displayed at the exhibition booth. We have many bag variations available in our webs shop if you wish to create stationary themed gift bags for your clientele! These bags can include ballpoint pens, lanyards and note pads, all supplied on our website. Your logo across the side of these markers will help support your business at events and keep your company’s name in the memory of others. With a branded highlighter your company will have the ultimate giveaway. When the highlighters run out of ink they can easily be refilled, ensuring your branded highlighters are used for a long time, and increasing the amount of advertising potential.